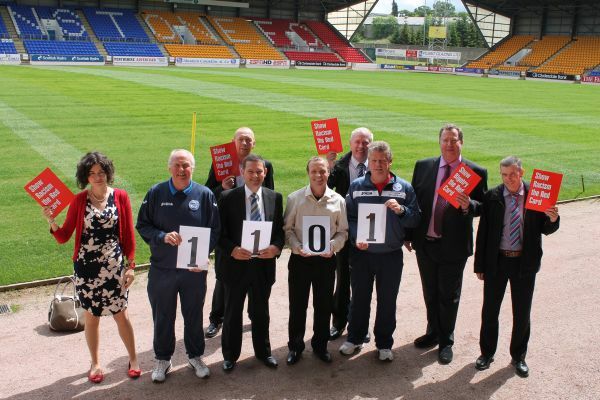 Perth and Kinross Council has renewed its partnership for a fifth year with Show Racism the Red Card in Scotland. The Council has worked with the national anti-racist charity since 2005. It entered into a formalised approach to joint working with Show Racism the Red Card and the club during the year 2008/9, in order to deliver the message to a wider audience, and in particular to schools. During 2011-12, a range of activities have taken place, from the continued prominent pitch-side display billboard at McDiarmid Park, to the sixth annual football match for mental health service users as part of the charity's fortnight of action in October 2011. An increased number of anti-racism education and coaching workshops were provided to schools throughout Perth and Kinross, carried out by St Johnstone's community coaches, with over 1000 children taking part. These workshops included 13 events using anti-racism materials launched last year which specifically relate to the Gypsy, Roma and Traveller communities. Community Safety Convener, Councillor Douglas Pover commented: "Using football as a medium to share the message of the dangers of racism has helped us, together with Show Racism the Red Card and St Johnstone FC, to reach a wide cross-section of the local community. The partnership we have is strong and effective and we will continue to work closely together to spread the word that racism will not be tolerated here in Perth and Kinross." Dee Kinning, Education Coordinator for Show Racism the Red card said “The campaign is delighted to be working again with Perth and Kinross Council and St Johnstone FC. The support we get from each is exceptional, alongside the Community Safety Partnership and the local UNISON branch. The team is looking forward to meeting a new group of young people in order to educate them against the dangers of racism and prejudice and inspire ways to ensure we live in a Scotland which is free from the scourge of racism and promotes equality for all."